"When people ask me what our most popular holster and gun belt is I always ask "what is your primary use?" because that .. The Dakota A1 QuickDraw Western Holster - May be ordered in a double gunslinger style too!The A1 QuickDraw is a classic ..
Circle KB's "A1 Roy" is one of the finest heirloom quality reproduction Spaghetti Western Hollywood style rigs available..
A dynamite looking A1 QuickDraw Buscadero rig that is easy on your pocketbook. 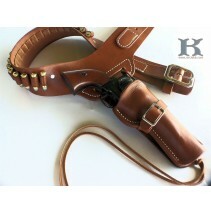 Unlined and carefully hand dyed black wit..
A great Hollywood style gunfighter cowboy holster and belt. An unlined A1 QuickDraw holster and authentic, hand cut co..